Miso Crafty Knits: Peanut Butter Bacon Time! Yesterday I mentioned that I did some cookie baking over the weekend. One of the cookies that I made was requested by Brett, which I was happy to oblige to since it was part of his birthday present. The cookies: Peanut Butter Bacon. 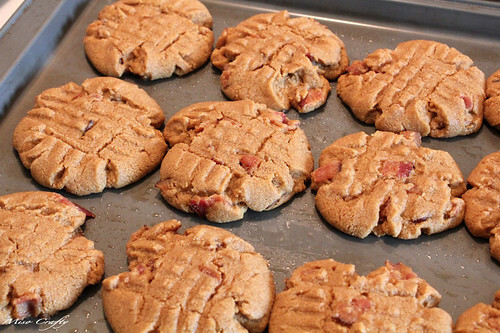 That's right, I said peanut butter and bacon in the same sentence...in the same cookie. I first learned about such a cookie combo from Joy the Baker's blog and had mentioned it to Brett. I was definitely intrigued by the recipe and Brett was drooling over the fact that you can make his favourite treat out of his 2 favourite flavours. I used Joy's recipe from off her blog and followed it to a T. I loved the fact that there were only 5 ingredients involved and neither of them was butter or flour! Definitely pay attention to the peanut butter that you use and that it's an all-natural one. No sugars added since you'll be adding a cup of sugar. If I were to ever make these again (and really, the only time I would is if Brett asked...I'm not a peanut butter cookie person myself), I would definitely cut down the sugar amounts since we both found the cookies to be quite sweet. Also, don't forget to stir the peanut butter in the jar before measuring it out, since natural PB has a tendency to separate from its natural oils. One of the things I learned from watching countless hours of Food Network: spray your measuring cup with Pam or vegetable spray before measuring PB, molasses, honey, or any other sticky substance of that nature. Makes getting the stuff out of the cup SO easy. I've personally never baked PB cookies before this (like I said before, I'm not a fan) but have been in the kitchen when others were making some. Yet I was still surprised at the consistency of the dough and had a hard time trying to figure out if the cookies were done or not. 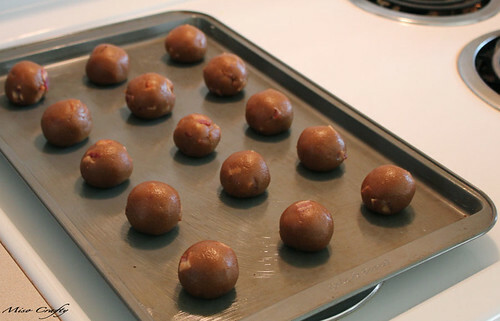 These are definitely not the kind of cookies you can steal off of the baking sheet to eat while they are still piping hot, cause they definitely need the cooling time to set up. Ask me how I know. Both Brett and I had no idea how these were going to taste. It could have gone 2 ways, either extremely delicious or extremely disgusting. Luckily for us, it was the former. The PB definitely definitely over-powers your taste buds but I find that the bacon gives a nice smoky depth to the overall flavour. Brett likes them, I'm a little "meh" about them. Although, while these bad boys were baking I have to admit that the house smelled so incredibly good! I think this recipe is more of a novelty item more than anything. Oh well, they were fun to bake! What have you been baking lately? What an interesting combination! Thanks for the comment on my puff. I used two double bed blankets to stuff it. I rolled them up and then wrapped the knitted piece around it then secured the top and bottom. I enjoyed them, although found that they were pretty similar in flavour to a plain old PB cookie, perhaps if I make them again I would try adding a little bit of liquid smoke?